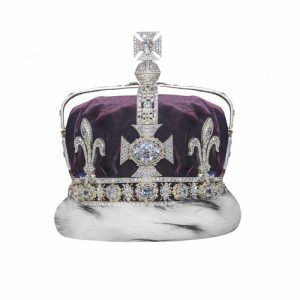 So as Prince Harry and Megan Markle Recently Married I thought I would give a little insight into The Tiara she wore on her big day! 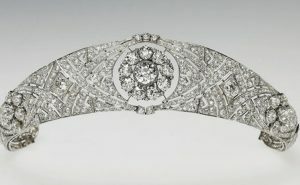 Queen Mary’s Diamond Bandeau Tiara. The Diamond Tiara hasn’t been seen since 1965 when Princess Margaret wore it last. 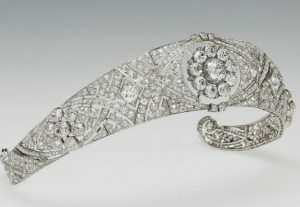 The Tiara was made in 1932. This English Tiara Features Diamonds set in Platinum and a Centre detachable brooch made of ten diamonds dating back to 1893. The Diamond Brooch in the centre of this Tiara was a present to Princess Mary in 1893 by the County of Lincoln on her marriage to Prince George, Duke of York, who would become King George V. The Tiara was then made in 1932 to have the brooch mounted in the centre, The bandeau and the brooch were passed down by Queen Mary to The Queen in 1953. Kensington Palace hasn’t associated a particular jewellery house or jeweller with the tiara, however it is thought to be by Garrard, which was the Crown Jeweller in the 1930’s. 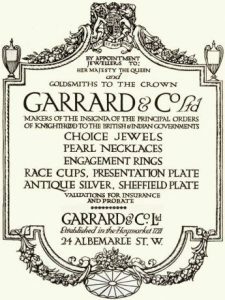 Garrard was established in 1735 and founded by George Wickes in London. 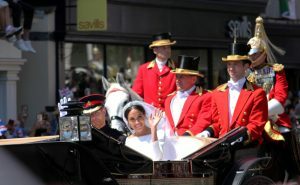 Garrard was The Crown Jeweller for 164 years! Starting in 1843 and ending in 2007. G. Collins and Sons are the current Royal Jewellers ending a 164 year reign by Garrard. Garrard has dealt with many famous Jewels, such as the Cullinan I, “The Great Star Of Africa”. They have also created some amazing pieces like the Imperial Crown Of India in 1911 and The Crown Of Queen Elizabeth in 1937. 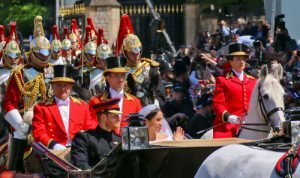 Although Garrard no longer holds the Royal Warrant as the Official British Royal Jeweller and G Collins and Sons were appointed by the Queen, Garrard still holds a royal warrant from her son the Prince Of Wales to this day.